David Hockney was born in Bradford and attended Bradford School of Art and later the Royal Academy School. Stereotypically a northerner the Yorkshire born artist is unapologetic and brave in his work. Since travelling to the USA in the early 1960’s he became increasingly influential in art terms and was a major contributor to Pop Art. Once in the US he moved to California and began a new phase as an artist making his ‘Splash’ paintings and later ‘Mr and Mrs Clark’, these paintings showed a more realistic style of painting but with a bright and cool colour palette which became typical of his work. Much of his artwork is based upon phis personal experiences and he brings much of this personal subject matter into his work. (Holmes, 2018). These personal experiences have been often recorded in his sketchbooks, and fortuitously he has several sketchbooks complete on his website allowing for a complete and full study as required on what and how he records his observations etc. Unlike others artist of t60’s he included domestic scenes in his work as well as portraits of friends. Along wing his oil paintings Hockney has explored many other genres of art and experimented with light, space and colour doing work on film sets, photographic collages as well as iPad drawing / paintings. (ELLE Decor, 2018). Hockney has always argued for artists to use technological assistance when doing drawing and producing art. He has famously upset some traditionalists by claiming that classical artists in the past had used device such as the camera obscura to produce some of their works. He has also modern technology using both the iPhone and iPad to produce artworks. He likes drawing outdoors and finds the convenience of these modern drawing devices invaluable. Line seems to be his main means at describing objects in his sketchbooks, looking at Figs. 5-1, 5-4, 5-5, 5-7 as examples he has exclusively used line to draw. In these drawings he uses a bare single line to describe a wall, a forehead, arm or shirt. This simplicity of detail is given life as Hockney uses this line with great accuracy and purity allowing your mind to fill in the details he has not described in these clean lined sketches. This line is of a single weight and little evidence of variety in weight is evident as he uses a biro or marker with no ability to offer a varied stroke on the paper. In some of his other drawings he utilises these drawing means to fill in some of the tone and add weight and mass as well as presence to some objects. See Figs. 5-3 and 5-8 as examples. In his Yorkshire, Bridlington sketchbook I have included examples of scenes done purely in a monochrome watercolour. In these he uses a mid and light grey with the occasional dark grey to draw his sketches offering a near complete range of tones in his scenes of rural and town. In some of these he uses lines drawn with the bush and Fig. 5-12 is quite reminiscent of a van Gogh scene in both subject matter and use of line and marks. The sun in this drawing seems to radiate its energy across and into the landscape. The ground of the foreground cultivated field has marks which seem to radiate back at the sun or at least vibrate with the energy from the sun. I have chosen three full colour examples of Hockney’s iPad drawings to illustrate the full glorious colour sketches that are possible in this medium. 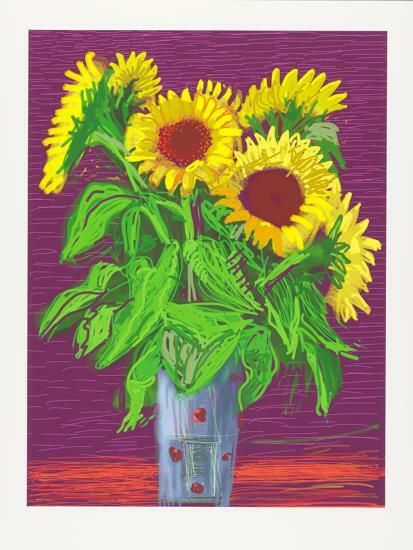 Hockney utilises the ‘Brushes’ drawing app to these and indeed, all of his iPad and iPhone drawings. With this drawing app Hockney has fund it possible to draw /paint using his flat colour tone style, he uses this to produce the image in Fig. 5-15 Lilies (2009). 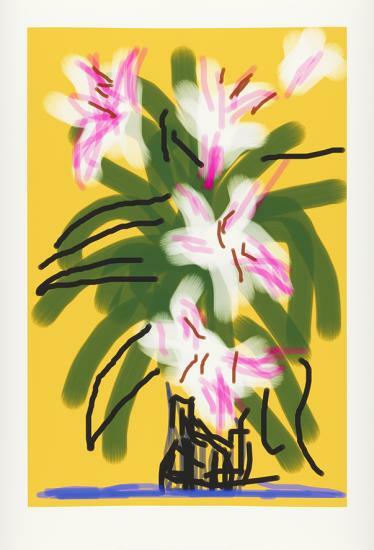 In this sketch on his iPhone he has layered green strokes over a yellow coloured background base layer to represent the flower foliage, this is then heightened with black lines to act as the stems of the plant and the flowers are a mix of white and pink shapes with crimson stamens lines. The vase is denoted with a few squiggled black lines and the shadow by a blue puddle -like shape under the vase. The vase of ‘Sunflowers’, Fig. 5-16 is another nod to the work of van Gogh. Here Hockney uses a similar set of posed sunflowers as a still life subject for a more realistic rendition of flowers than the ‘Lilies’. This increased realism is probably a result of the increased size that Hockney was working to using the iPad rather then his iPhone for this work. The use of an electronic device for drawing is one I intend to at least try in the near future. Annelyjudafineart.co.uk. (2018). Annely Juda Fine Art | Artists | David Hockney. [online] Available at: http://www.annelyjudafineart.co.uk/artists/david-hockney [Accessed 25 May 2018]. Annelyjudafineart.co.uk. (2018). Annely Juda Fine Art | Exhibitions | David Hockney: iPhone and iPad drawings 2009 – 2012 and New Photographic Drawings (2018). [online] Available at: http://www.annelyjudafineart.co.uk/exhibitions/iphone-and-ipad-drawings-2009-2012-david-hockney [Accessed 25 May 2018]. ELLE Decor. (2018). We Sat Down With Iconic Artist David Hockney — And Learned A Lot. [online] Available at: https://www.elledecor.com/design-decorate/interior-designers/g3401/david-hockney/ [Accessed 25 May 2018]. Holmes, J. (2018). David Hockney, Art History & Styles of Art – Art.com Wiki. [online] Art.com Wiki. 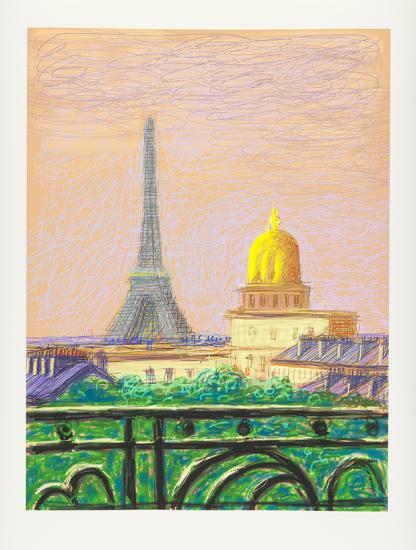 Available at: http://blog.art.com/artwiki/~/david-hockney/ [Accessed25 May 2018].